On August 10, 1821, Missouri entered the Union as the twenty-fourth state. 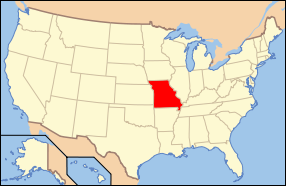 Named after the Native American people who originally inhabited the land, Missouri was acquired by the U.S. as part of the 1803 Louisiana Purchase. At that time, the territory's occupants were mainly French settlers. After the War of 1812, American settlers poured into the region. In 1818, the Speaker of the House of Representatives presented the first petition of the Territory of Missouri requesting statehood. The question of Missouri's admission as a slave or free state led statesman Henry Clay to devise the Missouri Compromise of 1820, admitting Missouri as a slave state while admitting Maine as a free state, and prohibiting slavery in Louisiana Territory north of the parallel 36º 30', Missouri's southern border. This resolution proved temporary. Congress passed the Compromise of 1850, a series of laws that amended the Fugitive Slave Act, abolished the slave trade in Washington, D.C., and admitted California to the Union as a free state. The Compromise of 1850 also established territorial governments in Utah and New Mexico, but left the issue of slavery in the new territories to be decided by the local residents. In 1854, the Kansas-Nebraska Act served to abrogate the Missouri Compromise. And in 1857, as a part of the Dred Scott decision, the U.S. Supreme Court declared the compromise unconstitutional by ruling that Congress had no power to bar slavery from a territory, as it had in 1820. Four years later, the slavery debate erupted in civil war. Originally part of the 1803 Louisiana Purchase, Missouri was admitted as a slave state in 1821 as part of the Missouri Compromise. It earned the nickname "Gateway to the West" because it served as a departure point for settlers heading to the west. It was the starting point and the return destination of the Lewis and Clark Expedition. River traffic and trade along the Mississippi was integral to the state's economy. To try to control flooding, by 1860 the state had completed construction of 140 miles (230 km) of levees on the Mississippi. The state was site of the epicenter of the 1812 New Madrid earthquake, possibly the most powerful earthquake in the United States since the founding of the country. Casualties were light due to the sparse population. Originally the state's western border was a straight line, defined as the meridian passing through the Kawsmouth, the point where the Kansas River enters the Missouri River. The river has moved since this designation. This line is known as the Osage Boundary. In 1835 the Platte Purchase was added to the northwest corner of the state after purchasing the land from the native tribes, making the Missouri River the border north of the Kansas River. This addition made what was already the largest state in the Union at the time (about 66,500 square miles (172,000 km2) to Virginia's 65,000 square miles (which included West Virginia at the time) even larger.